Today, I want to share an exciting salad with you that is incredibly refreshing and of course, nourishing – Mango Quinoa bean Salad. Wonderful lunch salad full of flavor texture and healthful goodness. Bring water to a boil in medium saucepan over high heat. Stir in rinsed and drained quinoa. Reduce heat cover pan. Simmer 12-15minutes or until water is absorbed. Now in a mixing bowl add rose coco beans, tomato, bell peppers, avocado, grated mango, olive oil, salt, ground cumin, cayenne peppers mix well. Add cooked quinoa , rockets stir gently and serve. 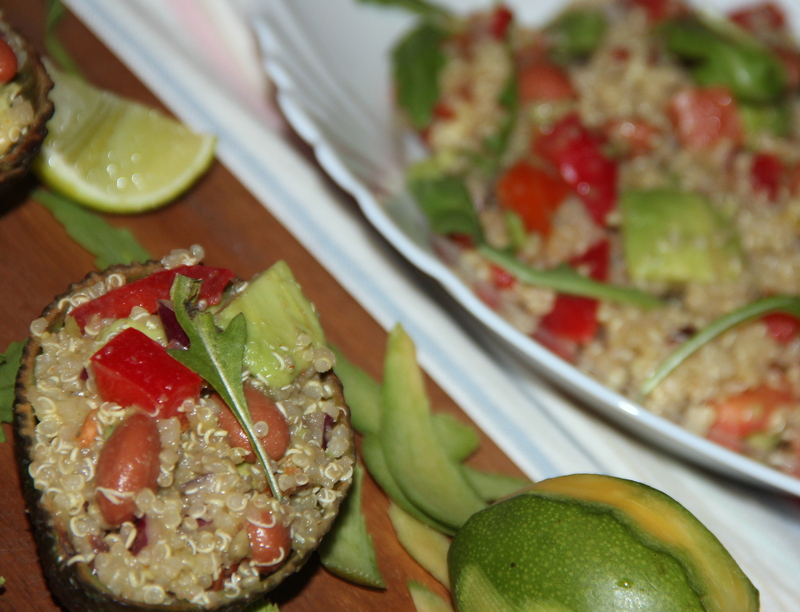 I used raw green mango which helps to give tangy taste and flavour-alternatively lime/lemon juice can be used. Posted on March 8, 2015, in Indian, Salad/Wraps. Bookmark the permalink. 28 Comments. Mango and avocado are two of my fave things. This looks delicious! Very healthy and nutrient rich! Wow!What an exotic welcome to the mango. Yumm..my taste buds are tingling. .
You are most welcome. Please reblog my posts on your blog too; for example funny pictures. ….